That’s a question that the average person could easily answer in just three words: water, sunlight, soil. 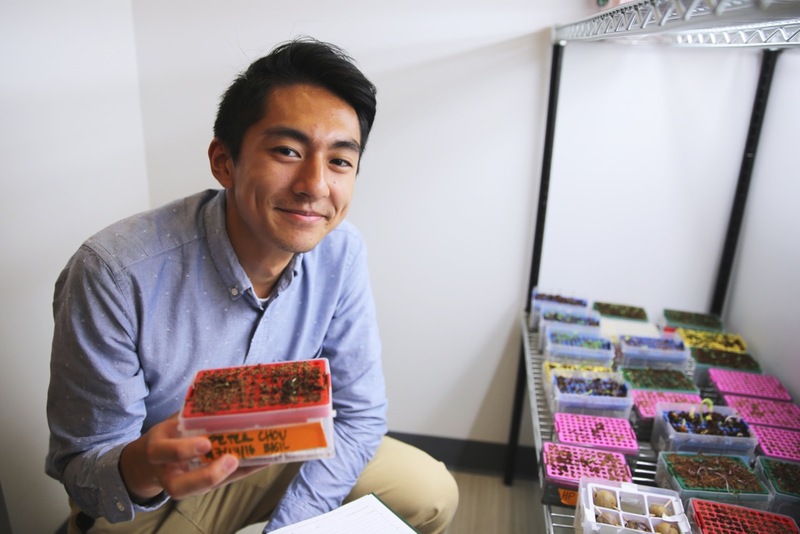 But wait—you’re reading this because you’re not the average person; you’re trying to become an expert in aquaponics and lead the movement towards a more sustainable future, right? Well, in order to do so, you must first be able to elaborate on that last point—soil. Plants do not just “take in” soil; rather, plants utilize the elements held within the soil in order to grow and carry out their life processes. Just to name a handful: potassium, calcium, magnesium, phosphorus, sulfur, iron, and, of course, nitrogen. Nitrogen in particular is an essential element for the survival of plants (as well as animals) because of its use in the creation of amino acids, and therefore the formation of proteins. Yet plants cannot simply absorb nitrogen in its elemental or gaseous form. No—plants must typically absorb the bulk of their nitrogen in the form of nitrate (NO3-). How other forms of nitrogen are converted to nitrate is a relatively complex process, and can be explained through the nitrogen cycle (see Laura’s post on this topic). However, this blog post will touch solely upon the form of nitrogen that precedes nitrate: nitrite. Not to be confused with nitrate (NO3-), nitrite (NO2-) is a polyatomic ion found within the soil, and is the intermediary between ammonia and nitrate. Responsible for the conversions between different forms of nitrogen are specialized bacteria, which are also found within the soil or—in the case of aquaponics—water. 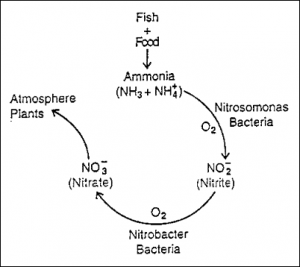 A basic diagram of the nitrogen cycle. Nitrosomonas is the bacteria responsible for the conversion between ammonia (NH3+) and nitrite. To a lesser degree, the bacteria Nitrosospira, Nitrosococcus, and Nitrosolobus also contribute to these changes. Nitrogen does not remain in the nitrite form for long, however; nitrite will rapidly oxidize into nitrate following its chemical conversion. In this second process, Nitrobacter, along with the aforementioned Nitrosospira and Nitrosococcus, take this nitrite and convert it into nitrate. With the nitrogen in its nitrate form, plants are finally able to absorb it for use in amino acid formation. When monitoring an aquaponics system, it is important to ensure that the level of nitrate within the water and/or soil is balanced. A level of nitrate that is too low can lead to insufficient amounts of nitrogen available to the plants; a level of nitrate that is too high can lead to hypoxia (insufficient oxygen reaching tissue) in the fish. Nitrate levels are interconnected with nitrite levels. 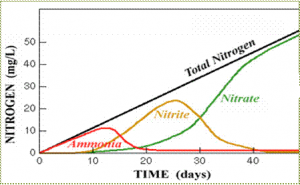 Nitrogen within an aquaponics system must undergo one full cycle before the system stabilizes. It is important to note that in the very beginning stages of an aquaponics system, nitrite (along with ammonia and nitrate) levels will start very low. This is normal; as time progresses, the fish will produce more waste and bacteria will multiply, leading to gradual growth in these concentrations. As shown in the graph above, a new aquaponics system will undergo peaks in levels of different measurements over time. In other words, the cycle must complete before the system stabilizes. After stabilization, your aquaponics system should see very low levels of both ammonia and nitrite (as instantaneous conversions take place), and high levels of nitrate. Here are a few general troubleshooting tips for maintaining healthy levels of nitrate and a healthy aquaponics system. Once the bacteria start producing nitrate, your nitrite levels should be as low as possible, below 0.5ppm. Before taking any action, however, remember to take comprehensive measurements of your system (ammonia, nitrate, nitrite, etc.) to ensure that you are pursuing the best possible solution. Because ammonia, nitrate, and nitrite are all closely intertwined, it is important to keep in mind how these three factors interact with one another. Nitrogen conversions with their respective species of nitrogen-fixing bacteria. 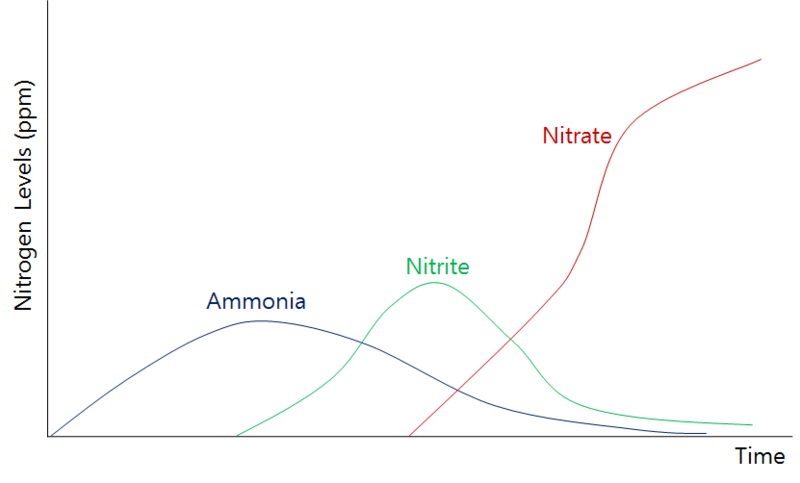 Once your system has cycled (see graph above: ammonia spike, nitrite spike, then nitrate stabilization), nitrite should not be above 0ppm because bacterial populations should be large enough to immediately transfer ammonia to nitrite, then to nitrate. If ammonia levels are low (0 mg/L): add more fish. The ammonia being produced by the fish via their waste may not be enough. 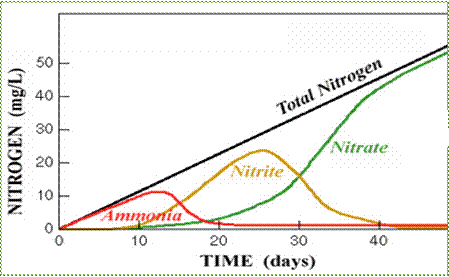 If nitrite and nitrate are both low (0 mg/L), but ammonia is high (>3 mg/L): add more bacteria. Nitrosomonas and nitrobacter bacteria populations may not be large enough to sustain the conversion of ammonia, resulting in high levels of ammonia and low levels of nitrate. This problem may be solved through introducing more bacteria into the system. When you SHOULD NOT see nitrite: after your system has cycled and stabilized. If you see nitrite levels above 1 mg/L: add more nitrobacter bacteria to convert the nitrite to nitrate. Nitrobacter is found in most commercial bacteria products such as API’s QuickStart Bacteria. • How will changing one aspect of my system affect other parts of my system? • Could there be any unintended consequences to this change I am about to make? • What is the main goal for my aquaponics system (high fish yield, plant yield, etc.)? Which solution will best suit my overall goal? • How might this change influence my system in the long-term? Maintaining a successful aquaponics system requires balance as well as trial and error. Do not be afraid to problem solve or take risks—that is part of what makes aquaponics so fun! Newton, David E. “Nitrates and Nitrites.” Environmental Encyclopedia. 4th ed. Vol. 2. Detroit: Gale, 2011. 1157-1158.Gale Virtual Reference Library. Web. 11 Sept. 2016. “Nitrification.” The Gale Encyclopedia of Science. Ed. K. Lee Lerner and Brenda Wilmoth Lerner. 4th ed. Vol. 4. Detroit: Gale, 2008. 2993-2995. Gale Virtual Reference Library. Web. 11 Sept. 2016.